The million dollar view from Piano Row suite 1403. Akin to The Hunger Games, Emerson’s lottery housing selection process is a high-stakes gamble and students have just begun to volunteer each other as tribute to pick out the best rooms. The process began for the 2016–2017 academic year on April 5, and will run through April 15. During this time, students will be trying to pick the perfect perch for their next year at Emerson. Some students want a room with a view, while others may want something on a more social floor or an option closer to a dining facility. There are nooks and crannies for everyone, and the ideal living situation can be found if one knows where to look. 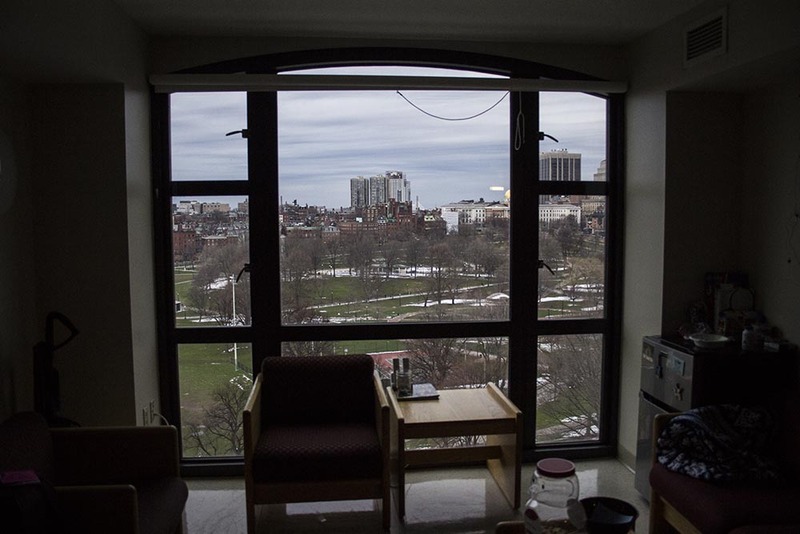 Sydney Torres, a sophomore performing arts student, said she randomly chose suite 712, a six-person suite with one double and four singles in the Colonial Building. Despite filling every blank wall with movie posters, lights, and personal memorabilia, Torres’ room doesn’t feel cramped. There’s even space for a refrigerator, television, bookcase, and keyboard—the last was her prime reason for choosing the long, narrow single, she said. Torres said that besides loving her spacious suite, she also enjoys living in the typically tranquil, modern Colonial. Colonial includes four, five, and six-person suites containing doubles, singles, and bathrooms. Dubbed by Emerson’s satirical news site Lion’s Tooth as the building where students go to retire, Colonial is quiet and spacious. Each floor has a kitchen and common space, and Torres said the only downside she’s found is the lack of thermostats in every room. But with a couple of extra blankets tucked away on her bed and a superhero-decorated bathroom, Torres said 100 Boylston St. has felt like home. Unfortunately not all Colo singles are that private. Rooms 15E and 18A on the upper four floors look into each other with only a few feet in between. The same peeping experience can be found in Piano Row. Rachael DeSantis, a freshman visual and media arts major who lives on the 14th floor of Piano Row, said she was drawn to the building after a friend recommended it for her first semester. She said growing up right outside of Boston she always used to walk by Emerson and “creep” on the dormitory. This building offers suite-style living for groups of four and six. Each room offers large windows, a common space and a kitchenette. It’s almost an even divide between freshman and sophomore students with many suites featuring both. DeSantis was also drawn to Piano Row because of the suite-style layout with the kitchenettes. Getting placed in a room with floor-to-ceiling windows that overlook the Boston Common was just a bonus. It’s a million-dollar view. The nearby Four Seasons Hotel offers rooms with a similar outlook starting at $765 a night. Not all Piano Row suites overlook the Common, though. According to floor plans, 01D doubles on each floor can completely see into the 08D doubles, and partly into a few others. Similarly, the 10C rooms have a view of the 05 suites’ common spaces on each level. Besides her private space, DeSantis said, she wanted to be in the building with the Bobbi Brown and Steven Plofker Gym because she was interested in going to games. The Max Cafe was also a draw because of its late-night dining options. The Paramount Center also offers a Board Buck-friendly meal spot for students. With only four floors of rooms, it’s the smallest living option on campus. It’s also a viable option for someone pursuing theater or film, as the center also has studios, multiple theaters, and the visual and media arts offices. Freshman Nathaniel Gibson, a visual and media arts student in Paramount 913B, originally listed the building as his last choice, but doesn’t regret living there, he said. Gibson’s six-person suite features three doubles, two showers, and two toilets, but not all Paramount dorms are the same. Four-person suites and standalone doubles are also available with one shared bathroom unit. Perhaps the biggest differentiating factor setting Paramount out from the rest of crowd, is the distance. Although many performing arts and visual and media arts classes and rehearsals are held in the building, the rest of the campus is located a few blocks away. Students groan about making the trek throughout the winter, but Gibson said it’s exaggerated. The Little Building houses the most students on campus and has suites and standalone rooms. Freshman visual and media arts major Kermel Yohannes said she was attracted to the spot because she could have a single in a suite as a freshman. LB is a more social living option, as many students can only find refuge from their dorm and roommates in each floor's common space. Communal bathrooms and long elevator lines allow for ample time for people to interact. This building also includes the STAR—Students Taking Active Roles—floor living community which is an opportunity for freshmen to live on a floor of all first-years, making for a petri dish of budding friendships. Many incoming students are not so lucky, as rooms can house up to four people in them, making for cramped quarters. LB is known as being one of the most social buildings, which draws in a lot of freshmen looking to connect with others and make new friends.